Graphics & Media Lab CMC of Lomonosov Moscow State University has about 10 years' experience in comprehensive analyzing of compressed video. In March 2013 Graphics & Media Lab (in cooperation with IITP RAS) has already released two reports on stereo films quality assessment since March 2013. In these reports we presented our evaluation results and overall quality comparison of 10 stereo films altogether. After a very successful release of Avatar the interest to stereo 3D films endures now a bad slump. Some people even think that 3D is dying and has no future. This decline of 3D demand has a serious background: many movie goers experience headache and eyestrain while watching a stereo film. We've received a lot of positive comments from professional stereographers on these reports and were encouraged to continue the work on stereo film evaluation. In many cases flat scenes are simply victims of declining budgets. Often times, companies will prioritize shots on the basis of length or fast motion the idea being that if a shot is very short/fast, no one will notice that it is 2D. For the most part, this approach is acceptable to the viewing public because they simply don't notice or don't care. One of the problems of intercutting 2D and 3D is the cumulative result of the brain expecting something it doesn't get. Over time, this mismatch in perception and expectation can result in a form of motion sickness (similar to when the ears and eyes don't agree on what they are perceiving). We are planning to publish three more reports in the 2nd half of 2013 and invite the stereographers for cooperation. Also, we are working hard to present our analysis of a stereo-window violation effect, which may be especially annoying in the more visible parts of the image. This issue appears in both captured and converted S3D films. In the overall comparison of the examined films we compare 15 S3D movies altogether from all three reports. 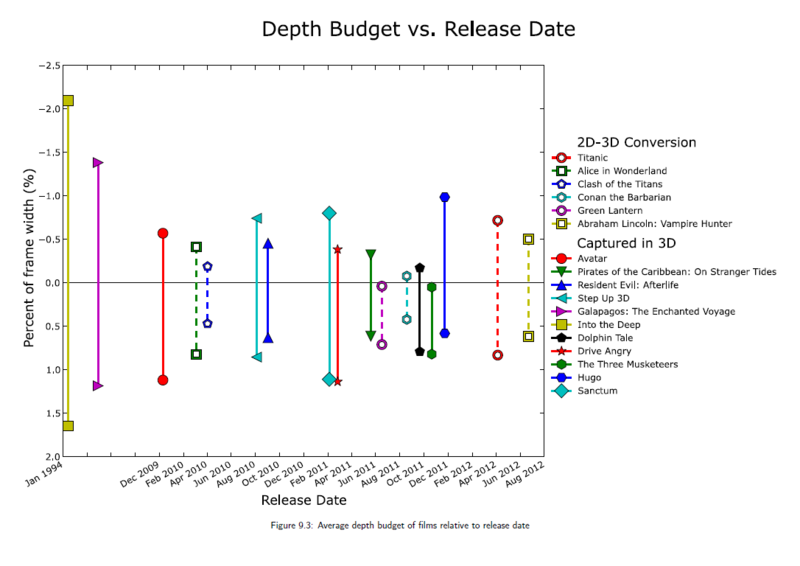 The report also provides the depth budget chart for both converted S3D films and captured ones (Image #4). It's clear from this chart that 'Green Lantern' has no objects in front of the screen, while 'Alice in Wonderland' has. It's also noticeable that converted S3D films generally have better vertical alignment than captured S3D films (Image #5). 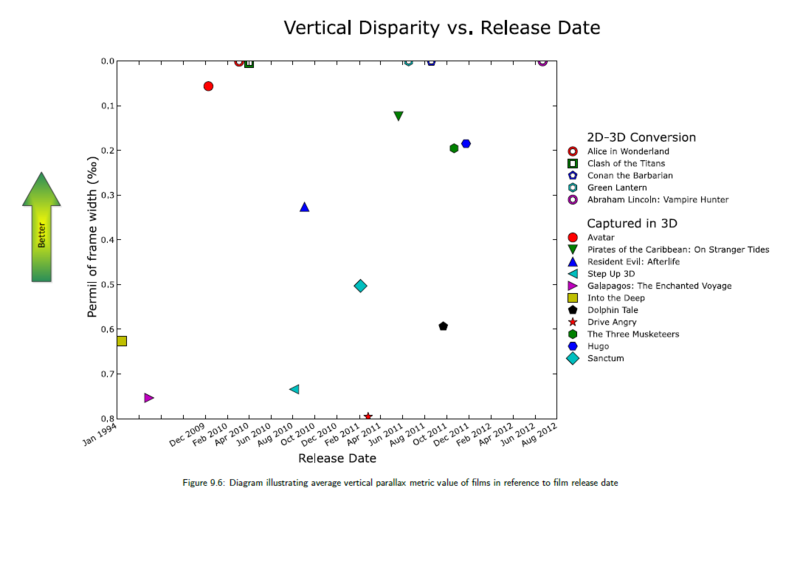 In fact, 'Abraham Lincoln: Vampire Hunter' has the best vertical alignment among the processed films. The same refers to color mismatch: the converted S3D films generally have much better color alignment between the left and right stereoscopic images (Image #6). 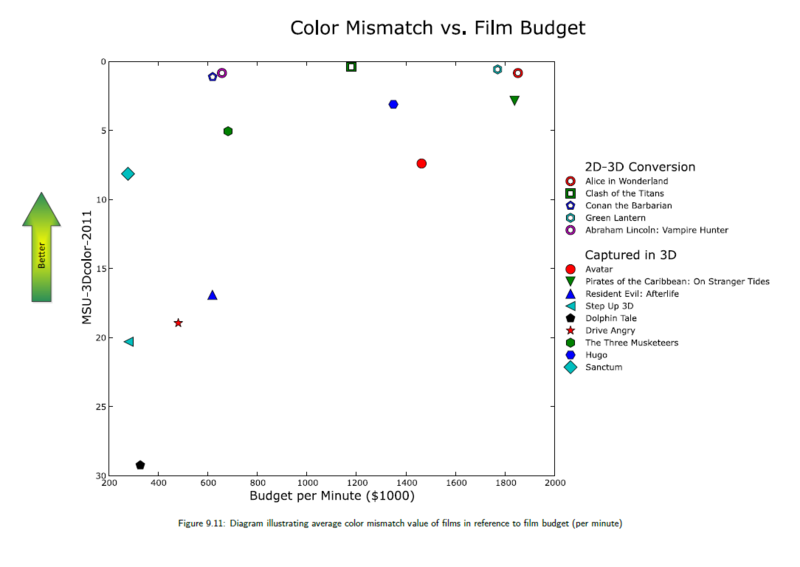 However, color mismatch still appears in converted S3D films and it turned out that color mismatch in 'Alice in Wonderland' was stronger than in 'Clash of the Titans'.